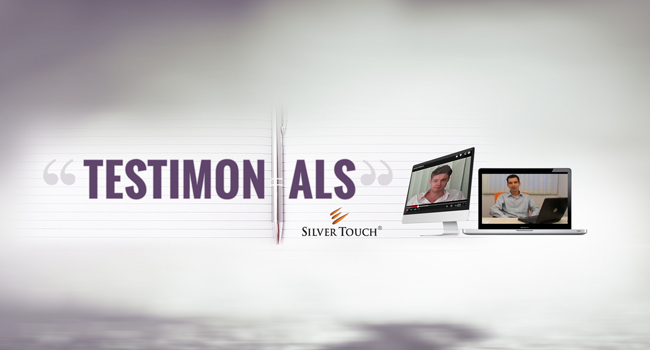 Silver Touch has received numerous testimonials from its customers. Here are few of them. Crossing through the barriers of time zone, language and other international communication limits, Silver Touch stayed firm in providing technology support at affordable costs & work ethics, but also the talent which was required by Ross Bays from America for web development. Truly thankful to this team! A unique idea of Gregory to share sea adventures to the audience over Internet was developed by the team of Silver Touch Technologies Ltd. Over the Joomla platform. A quick and exemplary approach was designed for him within a short time frame and delivered! Michiel Willekens works at Global Orange; a company which works as Consultant between European clients and Indian IT Companies. Global Orange initiated working with Silver Touch Technologies in 2008 with a small project of 1000 hours and then after it was never looking back for working on other huge sized simultaneous projects together. Silver Touch’s Silver Shop product has been proved a boon for Mr. Ashish Agarwal, who, after watching the demo decided to opt for it. The team developed innovative mobile application for his company and was always ready to provide support when required. Brilliant work! Robert DeLaat from The Logic Factory has shared his exceptional lines of being partners with Silver Touch Technologies through which they gained huge growth in terms of staff, faster development and profitable results while it has also assisted the firm in expanding its wings over the globe.